The units are configurable offering guests the option of spaces ranging from comfortable 1 bedroom studios, 2 bedroom units, 3 bedroom units, as well as the option to rent out the complete top two floors of the building as a 5 bedroom rental option. All rentals (expect Madrid) offer fully furnished/equipped kitchens, bathrooms, living rooms, offices and bedrooms that have been tastefully decorated. I've stayed at the Poblado suites a number of times in the Madrid, London and Paris suites, as well as a number of other apartments and hotels in Medellin over the past 3 years, and ALWAYS check to see if there is room at the Poblado Suites before going anywhere else. No other hotel or apartment group has the level of customer service and value like First American Realty (and I mean everyone from the receptionist and office staff to the maids) and there is no better location for the international traveler than the Poblado Suites - one block to the grocery store, one block to Parque Poblado, a few blocks to Parque Lleras (close enough for quick access, but far enough to get away from the noise), a short walk to the metro, and only minutes by taxi to downtown or any major shopping center, entertainment district or touristy site. As far as apartment furnishings go, they're better than what I have at home. I cannot recommend them enough (and always do when I run into other foreigners in Medellin, looking for a place to stay). Too bad I'm getting married to my Paisa here soon, and won't need to stay there so often anymore! Thanks for the great place to stay while I was in Medellin. If and when I return, and I hope I do, I would stay at Pobaldo Suites again. Its location is terrific and a good value. Thank you! 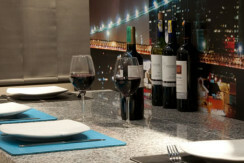 I have enjoyed all my stays at the Poblado Suites. They are convenient, within walking distance to many of the places I want to go. I particularly like them because they are almost new. The beds are very comfortable, and everything has been operational. The large showers are also a plus. It has been 7 days since I have moved into my new apartment and out of your fabulous, fabulous Poblado Suites apartments. I am finally getting settled in Medellin. I wanted to say how pleased I am with you and how pleased I was with the way you treated me during my stay. Your apartments are certainly the best option for the money in all of Medellin and I was very impressed with the thoughtful layout and architecture of the hotel. Nothing was left out and all the details were thought through, that hotel is wonderful, just wonderful. I never felt uneasy and all my needs were met while staying there but more important than the apartment is you. I always felt like you genuinely cared about my needs. I would not hesitate for one second to recommend anyone I can to you for any sort of business dealing because I know you are honest and trustworthy and what a refreshing thing that is to find so far from home. Well now Medellin is my new home and thanks to you the transition has been very enjoyable and safe. Thank you, I think of you as more than a business person but as a friend and deservedly so. 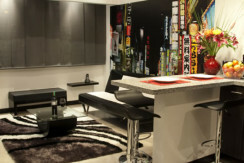 Poblado Suites presented a welcome change to me from standard hotel accommodations. In 2011 & 2012 I have spent more than 370 night in Hotels in 8 countries & 20 towns & cities. The Poblado Suites were quiet, secure, well designed accommodations, sufficiently supervised & allowed self management as to matters such as when to ask for assistance. I highly recommend the Poblado Suites for Medellin travel accommodations. Over the years I have stayed in many different apartments in Medellin but the Poblado Suites are the best I have encountered and I have stayed there ever since. It is conveniently located very close to Parque Lleras and Parque Poblado and it is easy to walk to restaurants and the market. The Poblado metro station is also not too far away. The apartments have a contemporary and well maintained appearance which I also enjoy. 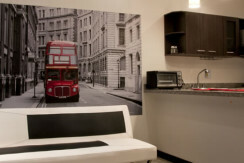 The staff is very helpful and accommodating and it is easy to get laundry done and the apartment cleaned upon request. I have recommended these apartments to friends in the past and will continue to do so. To my friends at First American Realty Medellin, I hail from Los Angeles so I know about quality lodging and good deals. I have to say Poblado Suites is a very smart way to lodge cost effectively in Medellin and be just minutes away walking distance to Parque Lleras, the Zona Rosa and the Golden Mile. Your prices are less than a hotel room and you guys offer so much more (nice suites, WIFI, big TV's, kitchen, air conditioning, the total package). Plus, privacy, as I do not have to walk by the reception desk every time I arrive or leave with guests. I have restaurants just seconds from my front door and a large supermarket just two minutes away. I will continue to be a happy repeat customer.